If you’ve never ordered a custom frame before (or even if you have) and you’re wondering how the process of ordering a Strong Frame works, click on this image for a quick overview or see the process in more detail below. You can also pick up a phone and call or send me an email with your questions. It’s our job to adapt to your level of technical knowledge or interest, so don’t be intimidated if you don’t feel you know enough to order a frame. Furthermore, if you don’t feel like you can offer accurate information, don’t worry. We know how to protect you from yourself. We’ve been designing and building frames over the phone for over 20 years and we understand the mistakes people can make. We have a process that will identify any problems long before we make any final decisions. The process is fun and if this is your first custom bike, you will learn about yourself, your priorities, and you’ll end up with a better understanding of frames and frame design. Even though waiting may be hard, it’s worth it. We may have many conversations leading up to your purchasing decision before you actually place your order. Once you do order, we’ll begin our order and design process. Your order is defined as being started once you take the plunge and make your deposit. At that point, through a series of phone conversations, we’ll guide you through every element of the frame design, accommodating your level of technical knowledge. We’ll translate your thoughts and words into specific frame design considerations, from frame size and fit to tube selection and geometry. No action is ever taken on our part until you have finalized your decision, are comfortable with your choices, and have given us the OK to move to the next stage. Scroll down to learn more about each stage of the order process. So you’ve made your choice, and we’re the lucky builder you’ve decided on. Give us a call, let use know you want to place an order, and we’ll get the ball rolling. This is when we’ll discuss the type of frame you want and the material you’re interested in. We can discuss the pros’ and cons’ of different choices to get the general idea of the direction we’re going to go. We’ll also talk about the reason you’re buying a new frame. Is it because you don’t have one, you need to solve fit or handling problems, you like to buy new frames, etc. We’ll also talk about the riding you do, you want to do, and your expectations for the new frame. At the end of the conversation we’ll give you a price estimate. Usually, we can give you an exact price but quite often all choices have not been finalized, so an exact price will not be available. Then we’ll get your contact information, take your deposit ($1000, payable by check, all major credit cards or PayPal), put you in the queue, and give you an estimated delivery date. You can also place a deposit here on our site and we’ll contact you to start the order process once we’re notified of the transaction. Deposits are non-refundable after 7 days of receipt date. When you place your order we’re going to give you some “Homework”. What we’ll need you to do is collect your body sizing information and current bike(s) size and setup information. You can read instructions on how to make these measurements here. This is where people get a little nervous, but don’t worry. We’ll know if you screw up, and we’ll help you with any questions you have. Our main goal at this stage is to understand your current riding experience and compare it to what we would expect based on your body measurements. If your current bikes fits well, or even perfectly that information is helpful. Equally as valid and useful is your current bike information if it fits or handles poorly. The key is to learn what you like and what you don’t like. We’ll develop an objective guideline and define a common language we can use to communicate with each other. Once we have all your info and we’re both confident that it’s accurate we can “crunch the numbers”. We’ll come up with some ideas on how we can approach the design in order to achieve your goals, and we’ll discuss them, making sure they are consistent with your expectations. We call it “preliminary” because at this point we’re not making any final decisions but we are starting to focus on specifics. In other words, exactly what design elements do we incorporate to accomplish the established goals. We’ll focus on the four design areas of fit, handling, ride and quality configuration. Fit: We figure out how you want to sit on the bike. This will depend on the type of riding you do. Do you prefer a more upright position or do you want a racier, more aero position? Do you have any injuries or physical conditions that require special considerations? Etc. Handling: Handling is the frame geometry and weight distribution. Depending on the frame type, rider preference, rider size, application and geographic locations we’ll decide on the necessary combination of specifics to accomplish your goals. Ride Characteristics: Tube choice will determine the feel of the frame. What diameter, shape, wall thickness/profile brand, and specific tube will be right for you. Decisions we make are based on tube diameter, which will determine the frame stiffness/comfort balance, and wall thickness, which determines the weight/durability balance of the frame. These choices are made based on your weight, the frame size, and of course your priorities. Once we have these guidelines determined, we can choose the manufacturer and tube models that will best meet your needs. We may choose to blend several brands and models or stick with a single brand, it all depends on your goals. Configuration: What type of frame do you want? Road, Cyclocross or Dirt Road? Maybe you’re looking for a 29er, Single Speed mountain bike with an EBB or sliders. We’ll also decide on material choice, tire clearance, brake type, color, decals, cable routing, etc. 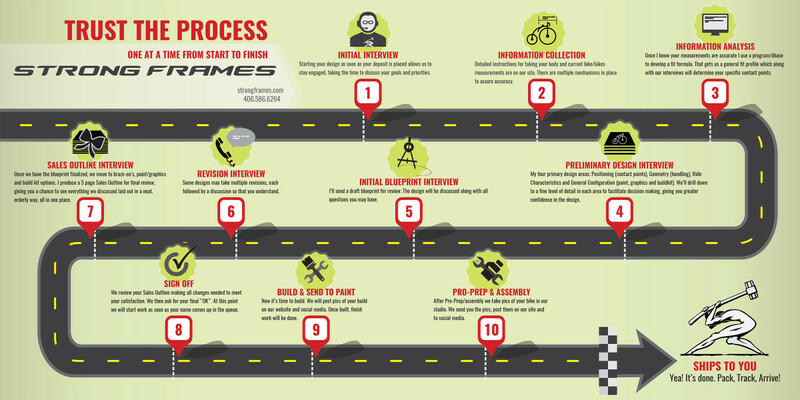 If you’re buying a complete bike or a frame and some parts, we will go over parts specifications as well. For build kits we offer a default part outline, however anything can be substituted, and now is the time we’ll discuss individual parts choices. Now that we have a pretty good idea of the frame design, it’s time to put pen to paper, or mouse to pad in our case. 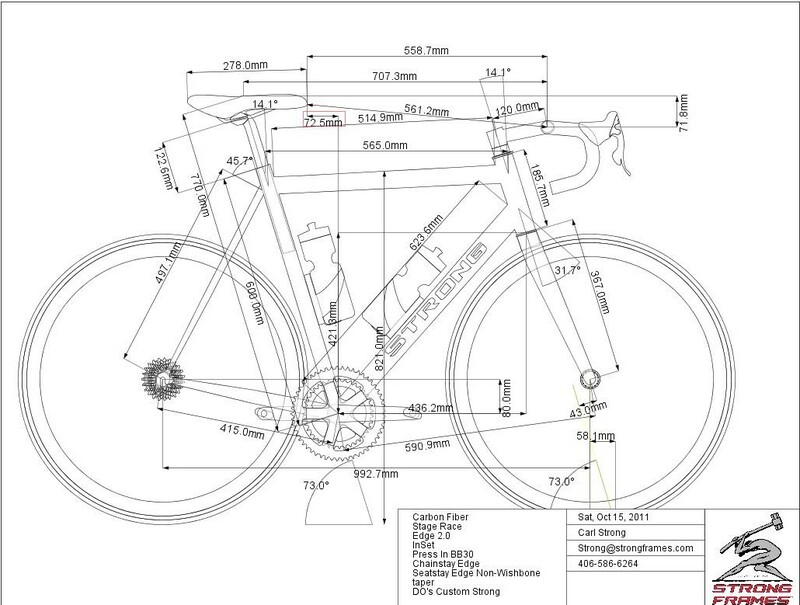 We use BikeCad Pro to generate our designs, and we will email you a PDF of the initial design, which will look like this. We then get on the phone, we will explain what the mess of lines means. We’ll also make sure we’re both comfortable with the design. If we want to try variations or make tweaks and changes, we can do it now. We’ll email you the revisions, in some cases while we are discussing them on the phone (technology is great). Once we have decided on a version, we’ll finalize it. This is the time to make final decisions on all choices, including paint, graphics, braze-ons’, and parts. While larger companies may have a formal sign-off sheet we prefer to just use a verbal. By this time we’ve been working together for a while, we have a relationship and we both know what’s going on. We’ll review all the details in a final conversation and if all is accurate and you’re ready to commit, we’ll email your Sales Outline (see example here) and blueprint for final review and ask for a verbal confirmation. Then we’ll move to the build phase. At this point you cannot make any changes. Now, we have your final design and your sign-off, as well as all your materials ready to go when your turn rolls around. Unless you contact us, or we have questions you won’t hear from us again until we’re ready to start your frame. Typically the day before we start your frame we’ll send you an email and let you know we’re starting. We’ll post pictures of the build on our blog so you can follow the progress of your frame and see it before it’s painted. Once the frame returns from paint, or in the case of titanium is finished in-house, we “Pro-Prep” it. That means your frame will be ready to assemble; all threads chased, faces faced and the HT and ST are reamed. We also supply seat collar, water bottle bolts, BB cable guide, and we treat the steel frames internally with a rust inhibitor. Now that your bike is built, we’ve got to get it to you in one piece with no damage. That means we take extra care in packaging. It may take you a half an hour to unwrap it, but at least it will be in perfect condition. If you ordered a complete bike we’ll have to remove some parts to fit it in the box, but it should only take a couple minutes for a qualified mechanic to reassemble it and have it on the road. Before we ship your bike, we’ll call to review the final balance and receive final payment. If you used a credit card, we’ll ask for permission to apply the final charge. We never charge a card without your permission. We will also double check your shipping information and coordinate a delivery schedule if needed. We’ll include a final copy of the paid invoice in your shipment and we’ll email you the tracking number so that you can keep an eye on the progress of the shipment. For international shipments your full invoice will be provided to the shipper as required by law and you will be responsible for all VAT, duty and other costs your country may charge you. After you’ve had a chance to ride the bike, we hope you’ll stay in touch. We hope you’ll send us a review of your experience and/or send us some pictures that we can add to our Owners Gallery. We don’t advertise so we depend on our customers’ positive feedback and referrals for new customers; so if we’ve met or exceeded your expectations, please let others know. Also keep in mind that if you ever decide to order another frame from us we give all our returning customers a 10% discount on steel and titanium frames.